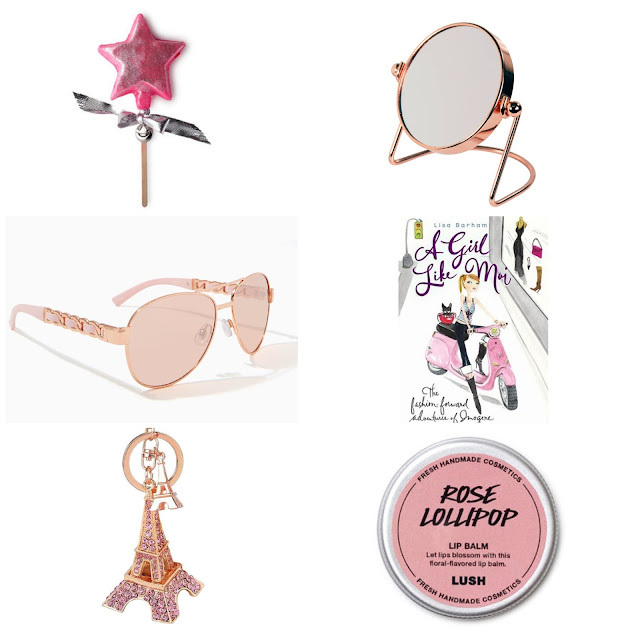 Southern Belle Forever: The Perfect Girly Gift Guide for a Fabulous Holiday! The Perfect Girly Gift Guide for a Fabulous Holiday! Yay! Today is the start of the holiday posts! I'm thrilled we're now so close to the holidays/Christmas! I thought it would be only fitting to do a gift guide for my first seasonal post! I love reading gift guides every year to get inspiration to see what I want to ask for. 1. Chandelier Earrings- Charming Charlie. These earrings are so beautiful! I love the tear drop gems! The gemstones are opal so they catch the listen and sparkle so perfectly! 2. Chenille Hoodie- Papaya. This material is really popular at the moment. I totally get it though because it's really soft and warm. Great for the colder Winter months! 3. Blush Crossbody Handbag- Betsey Johnson. First of all the blush pink color is amazing! The flower and bee patches are adorable. The texture as well as the bag is really fun and youthful! 4. Heart Charm- Pandora. You can tell my obsession with Rose Gold! The heart detailing on the sides and the little pattern in the gem is so special. 5. Rose Gold Sparkly Sneakers- Kate Spade x Keds. Love these shoes! The tie is ribbon material so it is so pretty tied in a bow. These are the fanciest sneakers a girl can have! 6. Pave Watch- Charming Charlie. I love these watches! They are amazing quality and you can change out the gray strap if you want. The pave gems are gorgeous! The rose gold hands and detailing go perfect with the watch! 1. Rose Gold Brush Set- BH Cosmetics. These brushes not only look great but are super soft. Applying them in the morning is so soothing. It's like your getting a face massage! 2. Parisienne Perfume- YSL. This scent is absolutely amazing. I especially love it in the Winter because it's not a super sweet floral scent; it's more understated. Plus the bottle is beautiful! Looks great on my vanity! 3.Warm Vanilla Sugar Fragrance Mist- Bath & Body Works. Now this scent is super sweet. It literally smells like a bakery making pastries! It always makes me want vanilla ice cream! 4. Glow-to Highlighter- Ciate London. This is a stunning powder highlighter. It comes in 4 amazing shades and I want them all! The packaging is also really pretty! 5. Makeup Bag- Charming Charlie. I love this bag! The saying is so cute and the color is so sparkly! There's nothing not to love! ​6. Sculpting Kit- Rimmel London. Everyone knows my thoughts on this palette because I did a post on it but if you haven't read it click here. This would be a great gift to give or receive! 1. Magical Wand Bubble Bar- Lush. This smells like cotton candy and is sparkly pink..... need I say more? 3. Avatar Sunglasses- Charming Charlie. These sunglasses are a feminine twist on the classic avatar sunglasses. They have a really unique woven pattern on the sides that are rose gold and pink. They are so pretty! 4. A Girl Like Moi By Lisa Barham- Barnes & Noble. I loved reading this book. I understand that not everyone loves to read but I passionately recommended this one if you love fashion! The little illustration on the cover and on the pages are such an adorable touch. 5. Sparkly Eiffel Tower Keychain- Amazon. This keychain is too cute not to share and I think every girl needs one! It's just so sparkly and pretty who could resist! ​6. Rose Lollipop Lip Balm- Lush. This lip balm smells amazing and is incredibly nourishing for dry, damaged lips. It's very hydrating and refreshing. The little tin is so cute as well. It also has really good benefits to help repair skin on your lips.